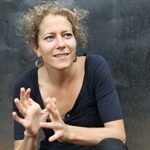 Since the award-winning Munich-based choreographer Anna Konjetzky began creating dance works and dance installations in 2005, she has achieved renown as an architect of spaces. In her project Breathing (2017), Konjetzky indicates in interviews, “I am interested in breathing as a very simple action that links everybody. I am interested in the very intimate aspect of it. I am interested in the transcendental experience of deep breathing. I am interested in the two big emotions or states that push breathing to an extreme: passion and fear.” Guided by this insistence, Breathing directs our attention to this often-missed liminality of experience. It prompts questions about the nature of something so common, yet potentially mysterious, and even the potential for physical and mental strength and endurance. Konjetzky forces dialogue about the navigation of the ambiguous path between the recognizable and the unexpected. What’s implicit in Konjetzky’s oeuvre is the reinvented sense of communitas, a reorientation in terms of group dynamics and shared intentions, of people coming together for the journey. Her astute awareness and understanding of living architecture results in a fundamental altering of the dance experience: the primacy of the individual on the path of transformation, as well as the complementary spectatorship and the kinesthetic empathy fostered in regard to the performer in passage and those moments of transcendence. Konjetzky crafts environments for her performers; for the spectator, the engagement with spaces outside a traditional stage setting is intimately linked to reformative experience, in which the viewer realigns their perception, strategizing their degree of control, the zone of knowingness, and a certain sort of readiness needed for navigating the trajectory. The powerful meaning of Konjetsky’s performance emerges from a mastery that acknowledges challenges and the restraints required to embark on the journey, as well as opening to new understandings of the ways in which the experience and engagement on the part of the dancers and the choreographer, and ultimately the spectator, mediates encoded meaning through concept-driven changes in emotional expression, visual perception, and physical embodiment. Ivar G. Hagendoorn, in his article “Some Speculative Hypotheses About the Nature and Perception of Dance and Choreography,” describes audience members as “virtually dancing along,” often feeling a discernable perceptual shift as they gaze in excitement or exhaustion. From a spectator’s perspective, for example, viewers can contemplate the strength and the demands of the dance, but they will also, almost certainly, understand or realize something about, or become aware of, their own interpretation of the dance piece. A key element of Konjetzky’s installation work, in constructing her architectural environment, is to forge a unique role for the visitor to the space, particularly their connection into what unfolds before them. The participant is never a benign spectator. In Imprints (2015), viewers hear breathing sounds, and see a figure locked into a reflective unadorned glass cube, the intimacy or claustrophobia of the microworld is heightened. There is a sensation of individual identification in watching the performer as a person scribbling on paper, bent over, crouched in confinement. The viewer can indulge in a voyeuristic fantasy that the performance exists for them alone. That immersive quality associated with the dance is intimately linked to one’s own absorption of what’s presented, which can be both disorienting and transformative for both dancer and viewer. Konjetzky’s work is wholly based on how we relate to space. She is an observer of how we live and how we order things in life. In Chipping (2014), she lays bare the possibilities of bodies moving in space, through the exploration of a space that seems to evolve. The set elements in the piece are a series of moving wooden cubes or boxes, plus associated drives, pulleys and cables, which shift incrementally or at other times are engaged in faster, more propulsive movements. While Konjetzky choreographs with an uncompromising honesty that expresses her personal vision, the human experience is fundamentally at the heart of her work. Throughout her catalogue of works, the choreographer emphasizes the importance of the individual on the path of transformation, as well as the complementary relationship and kinesthetic empathy between the audience and performers, fostering a shared passage toward a moment of transcendence. Philip Szporer is a Montreal-based dance writer, lecturer and filmmaker.